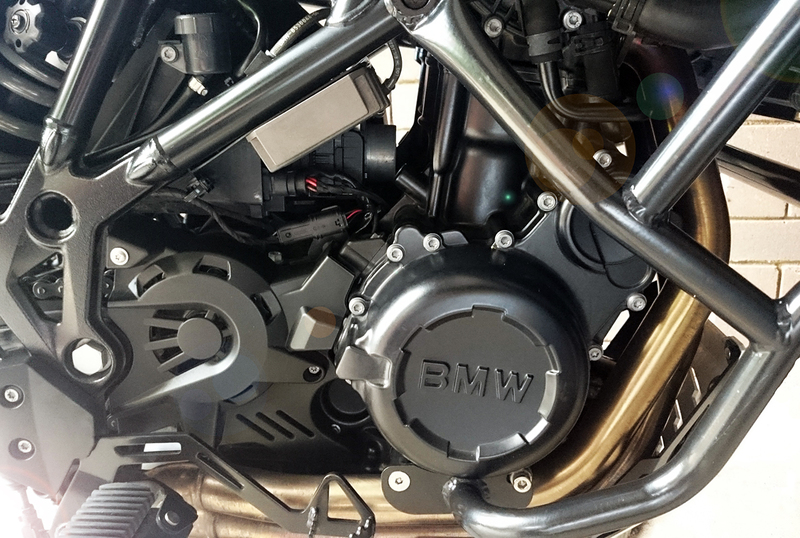 If you believe your local BMW dealer, servicing your F700/800GS is a hideously complex process that can only be undertaken after years fraught with arduous training and dedication. In actual fact, if you can remember ‘lefty loosey, righty tighty’, then you’re probably qualified to tackle the job. Now granted this isn’t for everyone, but as long as you’re not a total mechanical simpleton and don’t mind the word ‘SERVICE’ appearing on your dash every time you start the bike, you can do a 10,000km (6,000mile) service yourself in under an hour. The F-series’ 798cc parallel twin engine (built by Austrian firm, Rotax) has been used in a number of BMW and Husqvarna bikes since 2008. These engines are renowned for their durability, with the highest mileage bike I’ve seen having just clicked over 12o,000 kilometres (about 75,000 miles) without a rebuild. 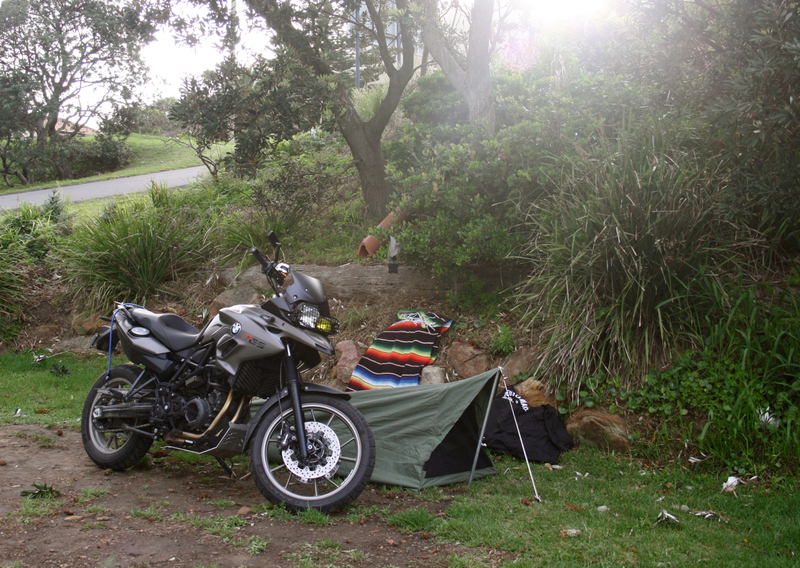 The bike pictured is my F700GS but the process is exactly the same for the F800GS and relatively similar for any bike that uses the ‘twin. Everything you need to service your F700/800GS in one picture! Tools needed for the job are minimal and if I didn’t have an SW-Motech bash plate, the only thing needed would have been a 10mm allen key and a strong set of hands. My bike has also been running a K&N oil filter, which has the handy benefit of featuring a 17mm hex head to allow easy fitting/removal. However, this comes with a caveat — more on that later. Take your bike for a ride. While this might sound odd, you want the oil to be nice and hot, as hot oil has a lower viscosity than cold oil. Put simply, you’ll get more old oil out easier when it’s hot. 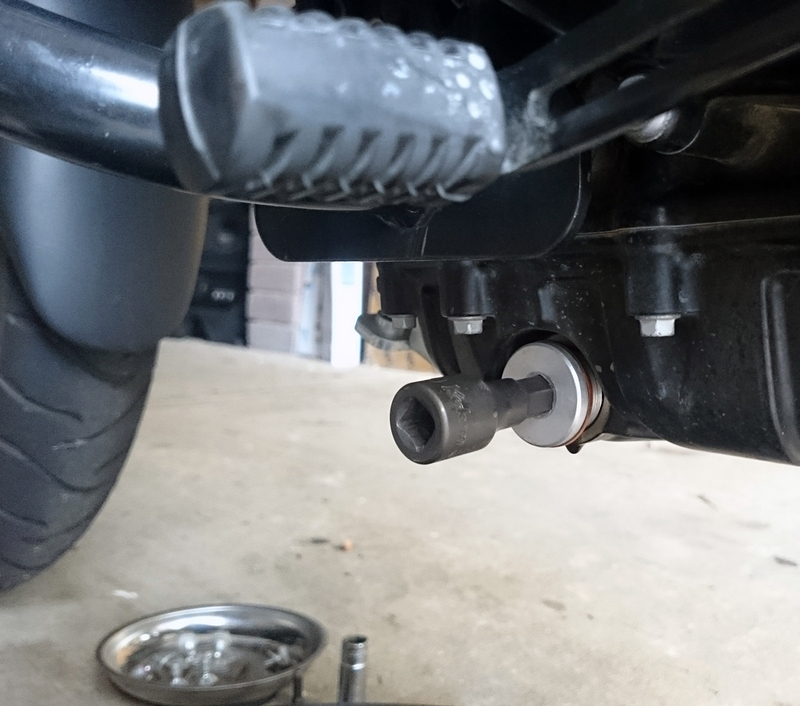 Once you’re back from your ride pop the bike on its centre stand and remove any bash plate that hinders your access to the 10mm, silver allen key bolt on the left-hand-side of the bike or the oil filter up front next to the headers. 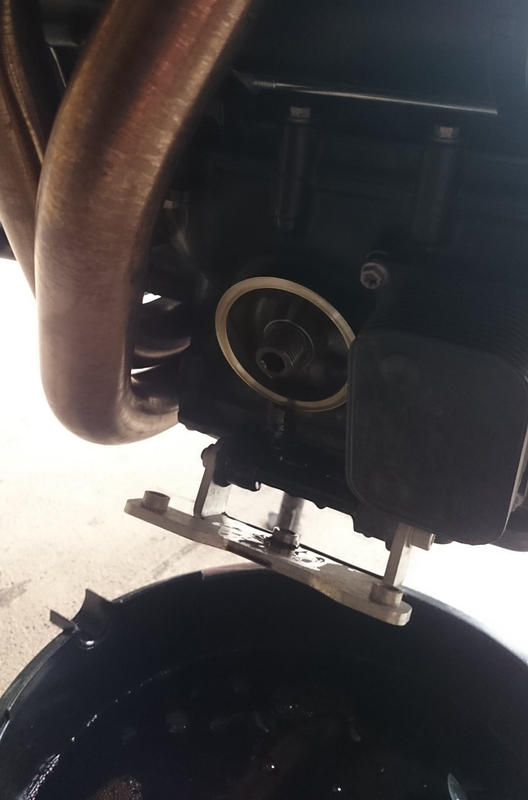 While you’re here, loosen the oil filler cap (which is also the dip-stick) on the left hand side of the engine. I always drop the oil filter first. Partly because there’s easy access (for road debris from the front wheel too — good one BMW) and partly because it will only need to drain for a short amount of time. This is made slightly easier due to the previous mentioned K&N oil filter’s 17mm hex head, but you should be able to un-screw a normal oil filter with your hand. If you can’t, it’s been over tightened. With the filter off, clean the machined surface and make sure the old oil filter hasn’t left its rubber seal behind (the silver bracket at the bottom is part of my bash-plate). With the filter off it will only drain oil for about 30-40 seconds. Once the oil has stopped, clean the machined surface up with a rag and prepare your new oil filter for fitting by wiping a small amount of fresh oil on the rubber seal. When you put the new filter on the bike, remember it’s not a strong-man competition. You’re only doing it up tight enough for the rubber seal to work. A good tip is to tighten it with your fingers — if you’re getting two hands and your shoulders involved, it’s too tight. With the oil filter changed it’s time to turn your attention to getting the rest of the oil out of the motor. To do this, you’re going to un-do thes silver 10mm allen key on the left hand side of the bike. Keep in mind, that this ‘sump’ plug is going to be hot. To get around this, I crack the allen key with my ratchet and then remove the socket from the ratchet to wind the remaining thread out my hand. Remember, this sucker’s going to be hot and you don’t want to drop it in almost 3L of oil. With the sump plug out, you’re going to want to let it drain for about 5-10 minutes, depending on your levels of patience. You’ll also want to take this opportunity to clean the magnet on the end of the sump plug. As the bike’s engine and gearbox share oil, the magnet is there to catch any minuscule particles of metal that end up in oil. Once the oil’s stopped flowing, you can put your sump plug back in. Make sure you change the copper washer on the plug as this provides the seal between it and the oil you’re about to put back in the engine. Any, auto store should sell them and you’re looking for a copper washer with a 24mm inner diameter and a 30mm outer diameter. Once your oil filter and sump plug are tight (but not too tight), it’s time to replace that oil you’ve just drained out. 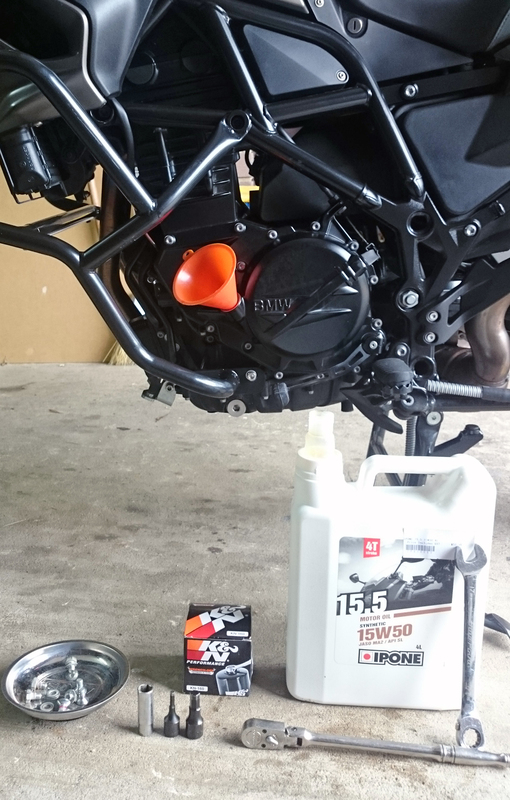 For Australian conditions BMW recommends a 15W-50 Castrol oil, but as long as you use a similar weight oil with API SJ/JASO MA2 specs, you’re in the clear. I went with Ipone’s 15.5 semi-synthetic because it met the required specs and was $20 cheaper than the Castrol equivalent. There’s a lot of forum feuding about what oil’s best, but as long the weight and specs are correct, you’re going to be fine. Oh, and before you crack the sh*ts about the oil not being ‘fully’ synthetic, keep in mind I’m halving the service intervals BMW recommends. BMW says the engine takes 2.9L of oil (with an oil filter change) but it’s much easier to put oil in than take it out. I put around 2.5-2.6L oil oil in and start the bike, allowing the oil filter to fill the new filter — it only needs to run for about 15-20 seconds. After you’ve waited for a few minutes, you can adjust the oil level on the dip stick that forms part of the oil cap to just below the top line. Job done! Final step: ride your bike!